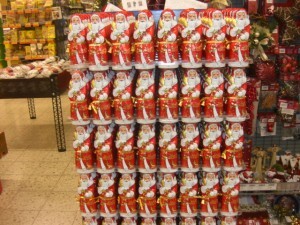 About a week ago, I spotted all these Nikoläuse (plural for Nikolaus) in our local supermarket. Either the Nikolaus’s early appearance had lapsed into oblivion over the years, or sales are getting more aggressive. It’s probably a combination of both. These Stiefelgeschenke (stocking fillers) are meant for the morning of December 6, when Nikolaus comes around, and rewards the good children by stuffing goodies into their boots left outside the home. Even though Nikolaus might resemble Santa, they are two different traditions . Nikolaus was a Greek bishop (4th century) and Santa, well, he is from the Northpole. I do miss the 60s for our innocence. We children did not expect anything and there was nothing whatsoever, resembling Nikolaus (Dec 6) or Christkind (Dec 24), in any village grocery store. Our parents left us behind with an aunt, when they did their Christmas shopping in the nearby town. I have to admit I had my first taste of Lebkuchen and Zimtsterne (traditional Christmas cookies). The other day though, I refused a cup of hot Glühwein (mulled wine), as I don’t want to have it too early, because I might get tired of it even before the Christmarket season begins. At Allthingsgerman, you can read more on Der Niklaustag. This is just in case if you have ever wondered about the chocolate-covered cubes decorating the supermarket shelves. These simple pralines are part of the seasonal section, indicating that Christmas is just around the corner – from the marketing viewpoint only. They are called Dominosteine, just like the Domino game . But this kind here is much yummier. 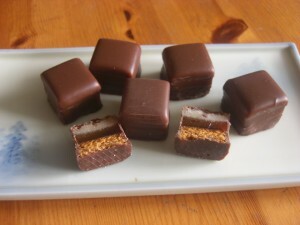 These Domino pralines are filled with three layers of Lebkuchen, jelly, and marzipan. I have cut one open for you to get a good luck at its heavenly inner life. 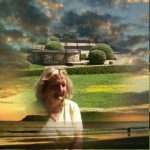 Try them - you might like them! None of my foreign friends and acquaintances had ever tasted them before, hence the reason for this post. Most really liked it, even though the taste of marzipan can be rather sweet by itself. 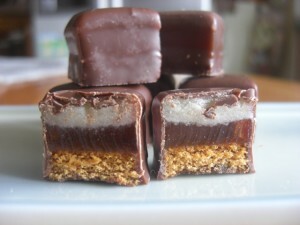 Once, during my two-year stay in the U.S.A., I really got desperate for marzipan and learned how to make it myself. Just mix the right amount of powdered almonds, powdered sugar, and warm water. Voilà! You’ve got homemade marzipan. To hear a simple explanation and a short discussion of Dominosteine in German, listen to our podcast. And no – this is not paid advertising. I just really love them and hope you enjoy them, too. 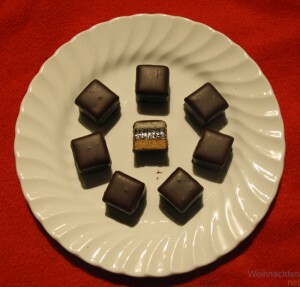 The word Dominostein is used to describe a small baked sweet that is eaten at Christmas time in Germany. It is made up of two or three layers, the base being Lebkuchen, the middle fruit jelly, and the top layer marzipan or persipan. This is then covered in a thin chocolate coating. Dominosteine are a relatively recent invention. They were created in Dresden in 1936 and were popular during the Second World War as a form of sweet due to the small amounts of ingredients needed to make them. Throughout December we will be publishing two German Words Explained podcasts each week. The extra podcasts will appear on the 7th, 14th, 21st, 24th and 31st. Lebkuchen is a type of cake associated with Christmas. It is baked using honey and a number of spices and is known throughout Germany by a variety of names such as Pfefferkuchen and Magenbrot. 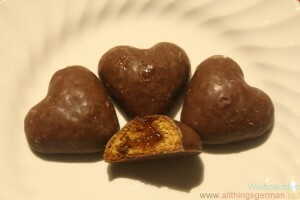 There are filled and unfilled versions, some covered in chocolate. It tastes similar to gingerbread.